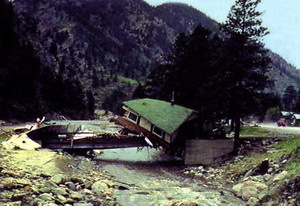 The Big Thompson Flood in 1976 claimed the lives of 143 Coloradoans in what is Colorado's deadliest natural disaster. July 31, 1976 started like most other summer days in Colorado. It was 1976 and the nation was celebrating its bicentennial and Colorado was celebrating its centennial. What should have been a quiet summer day quickly turned disastrous as the Big Thompson Flood killed more than 100 people in Colorado’s deadliest natural disaster. In terms of weather, the day started out much like one would expect but by late afternoon storm clouds loomed over the mountains. Mountain thunderstorms are an almost daily occurrence in Colorado but the storm that struck in the early evening that day was unlike any other. With light winds aloft, the storm stalled over the upper portion of the Big Thompson basin where it sat dumping tremendous amounts of rain – nearly 8 inches in one hour and 12 inches over four hours. The rain came so fast that the water didn’t have time to be absorbed into the ground. ~ Radio transmission by Sergeant Willis Hugh Purdy, Colorado State Patrol. Purdy was never heard from again. In the mid-sections of the canyon and lower, there was little indication of what was to come. The flash flood that resulted from the rain further up rushed down the canyon creating a wall of water that was 20 feet high in places. The flood scoured the canyon of everything – cars, homes, buildings and people. When the flood was over, 143 people had lost their lives, more than in any other natural disaster in state history. 418 homes, 52 businesses and 400 cars were destroyed at a cost of over $40 million. This story was originally published on the Denver Weather Examiner. Be sure to visit Examiner.com for all the latest Denver and Colorado weather news and information. This entry was posted on Saturday, July 31st, 2010 at 12:00pm MDT and is filed under Colorado Weather, Natural Disasters, Severe Weather. You can follow any responses to this entry through the RSS 2.0 feed. You can skip to the end and leave a response. Pinging is currently not allowed. Truly a tragic day in Colorado history. Anyone who has been in Colorado for long knows how dangerous our weather can be but thankfully this type of thing is rare.